Indiana's first head football coach, A.B. Woodford led the Hoosiers to a tie and a loss in his only two games. In the only documented game of the 1889 sea- son Indiana lost to Wabash, 40-2. Evans Wollen led the Hoosiers to an 0-1 record. Billy Herod's lone campaign as head football coach at Indiana resulted in a 1-5 record. Herod led the team to a 30-0 rout over the Louisville Athletic Club in the opening contest but the team went winless for the remainder of the season. Ferbert and Huddleston guided the Hoosiers for only one season and finished winless for the year. The closest game the Hoosiers played that season was a 20-10 loss to DePauw. The team was forced to forfeit the Purdue game that season. The coaching tandem of Dana Osgood and Wren led the Hoosiers to a 4-3-1 record in the coaches' only season at Indiana University. IU collected wins against the Louisville A.C., Noblesville A.C., Rose Polytechnic, and then- rival Wabash. In his two seasons at the helm of Indiana's football team, Madison Gonterman led the Hoosiers to winning records both years. After going 6-2, including a six-game winning streak in his first season, Gonterman responded with a solid 6-1-1 mark before leaving Bloomington. His overall mark was 12-3-1. After coaching the Hoosiers to winning records in 1898 and 1899, Horne and his IU football team joined the Western Conference at the beginning of the century. While leading his IU teams to six non-losing records in his seven years, Horne compiled a career record of 33-21-5. His best season came in 1899 when he led the Hoosiers to a 6-2 mark. As a member of the Big Ten, IU enjoyed its best season in Horne's last season as head coach when the team achieved a 6-4 record in 1904. With a 35-26-3 record, James Sheldon proved to be one of the most successful IU football coaches. His 8-1-1 record as a rookie coach in 1905 was his best mark. Overall, Sheldon led the Hoosiers to four winning seasons and helped IU climb as high as third in the Big Ten Conference rankings. Clarence Childs led Indiana to a 6-7-1 record during his two seasons. Childs' best mark came in his final season, when he mustered a 3-3-1 record (1-3 in league play). Childs fin- ished with a 2-7 record in Big Ten action but compiled a 4-0-1 record outside the confer- ence. Ewald Stiehm coached the Hoosiers for five seasons. He led his squads to a 20-18-1 record during that span and finished with a 5- 10-1 conference record. In 1917, he led the Hoosiers to a 5-2 mark. James Herron coached IU for only one sea- son. In 1921, he led the Hoosiers to a 1-4-2 record. In 1923, William Ingram became Indiana's 12th head football coach and promptly led the team to a 3-4 record while finishing fifth in Big Ten play. In his three seasons at Indiana, Ingram achieved a career mark of 10-12-1 and was 3-8-1 in conference play. 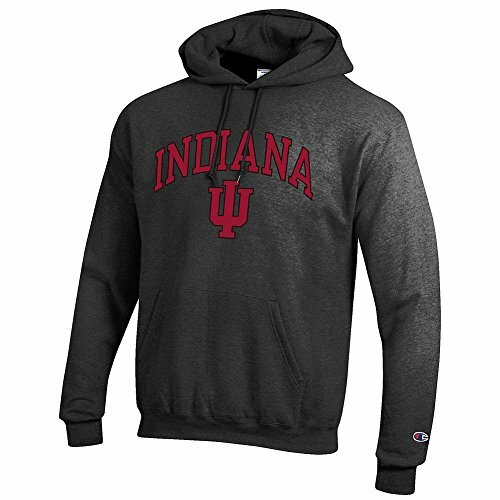 His best season came in 1924, when he led Indiana to a 4-4 record. Harlan O. (Pat) Page coached the Hoosiers for five seasons and guided Indiana to an overall record of 14-24-3. His best season at the IU helm came in 1928, when he led the team to a 4-4 record (2-4 in the Big Ten). Big Ten Record at Indiana: 4-11-4 Internationally renown for leading IU's track and field program to national prominence, E.C. (Billy) Hayes also coached the IU football team for three seasons. He helped lead the Hoosiers to an overall record of 8-14-4. His winningest season was in 1931 when he guid- ed Indiana to a 4-5-1 record. As IU's track and field coach, Hayes led the Hoosiers to eight Big Ten championships and 70 Big Ten team and individual titles in indoor and out- door track and field. Indiana also won the 1932 NCAA outdoor track and field champi- onships. Indiana's world-class outdoor track, and the NCAA trophy for the team champion in cross country, are both named in his honor. Perhaps Indiana's most successful coach, Bo McMillin holds the honor of being the only coach to ever lead the Hoosiers to an outright Big Ten Championship. In 1945, he led IU to its only unbeaten record and garnered Man-of- the-Year and Coach-of-the-Year honors by the Football Writers Association and the Football Coaches Association, respectively. 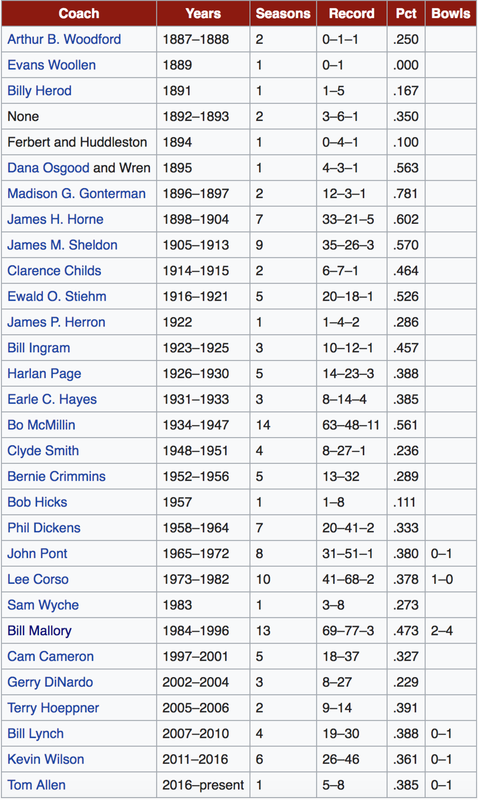 While at Indiana, McMillin guided IU to 10 non-losing seasons, including a stretch of six consecutive non-losing years. His 34-34-6 Big Ten mark is the best winning percentage in Big Ten play for an Indiana coach, as is his overall winning percentage. Clyde Smith took over IU in 1948 after serving as an assistant coach on Bo McMillin's staff. His best record at Indiana was 3-5-1, which he accomplished in 1950. Impressively, five of Smith's eight career victories were against Big Ten opponents. It was a conference that was extremely competitive at the time. The following quote best summarized the soft spoken coach, "Winning football teams are not the result of dressing room speeches. Victory comes from that mental toughness that comes from working night after night to improve." After coaching under legendary Frank Leahy at Notre Dame, Bernie Crimmins took over at the Hoosier helm in 1952. In five seasons, Crimmins led the team to a 13-32 record. A native of Louisville, Ky., Crimmins was a three-sport star for St. Xavier H. S. before starring for the Fighting Irish for four seasons at right halfback, fullback, and guard. He became the first man in Notre Dame's rich football history to win major awards at three different positions. Bob Hicks served as Indiana's interim head coach for one season prior to becoming its head line coach when Phil Dickens assumed the head coach's role. Hicks was asked to serve as head coach for a season as Dickens was forced to sit out for alleged recruiting violations. A 1948 graduate of Tennessee, Hicks played on the line for UT. After five years coaching at the high school level, he received his first opportunity to coach as a member of Dickens' staff at Wyoming, where he helped build highly competitive lines for the Cowboys' powerhouse clubs. Hicks would coach on the IU staff for 16 years. Phil Dickens, widely recognized as one of Tennessee's all-time greatest tailbacks, tal- lied an 89-67-11 record during his 16-year coaching career at Wofford, Wyoming, and Indiana. He became IU's head coach after leading Wyoming to a Skyline championship and an undefeated season in 1956. At Indiana, Dickens accumulated a 20-41-2 record. His best record was achieved in 1958 when he guided the Hoosiers to a fifth-place finish in the Big Ten. Dickens was named the "Midwest Coach-of-the-Year" that season and finished third in national voting. As a player at Tennessee he was an unanimous All-SEC pick in 1936 and was selected as the Volunteers' outstanding athlete during each of his four years at the school. John Pont holds the distinction of being the only coach to ever guide Indiana to a Rose Bowl appearance. He accomplished that feat in 1967 when he led the Hoosiers to a 9-2 record, a Big Ten co-championship, and an appearance in the Rose Bowl against eventual national champion Southern California. Perhaps more remarkable than the Hoosiers' strong showing against the national champs was the fact that this same team could only muster a 1-8-1 record the previous season, thus making the '67 Big Ten Champions a true "rags to roses" story. Pont earned unanimous national coach-of-the-year honors that sea- son and was selected as head coach of the East team in the 1968 Coaches' All-American game. Pont's jersey is retired at Miami (Ohio) and in 1969 he was one of six charter members inducted into the school's Hall of Fame. Lee Corso took over as head football coach in 1973 after leading the Louisville Cardinals to two Missouri Valley Conference titles in four seasons. At IU, he led the Hoosiers to two winning seasons and a 1979 Holiday Bowl victory over previously unbeaten Brigham Young. Indiana's victory against the Cougars propelled Corso's team to 16th in the UPI poll, the Hoosiers' first top-20 ranking since 1967. While at Indiana, Corso was active with the American Football Coaches Association. He also served on the Ethics Committee, the Rules Committee, and the NCAA Public Relations Seminar. During his tenure he coached in the All-American Bowl and the Japan Bowl. Corso is currently employed by ESPN where he works as a studio analyst on College Gameday. Sam Wyche was Indiana's head football coach for only one season prior to leaving for the National Football League. An assistant coach on Bill Walsh's San Francisco 49ers staff that won the Super Bowl following the 1981 season, Wyche was named IU head coach in 1983 and guided the Hoosiers to a 3- 8 mark that year. He then left IU to become the head coach of the Cincinnati Bengals. He led that squad to the 1988 AFC Championship and a Super Bowl berth against the 49ers. Wyche coached the Bengals for eight sea- sons before becoming the head coach of the Tampa Bay Buccaneers in 1991. He also coached the Bengals for five seasons and is currently a color commentator on NFL broad- casts. Bill Mallory served 11 years at the helm of the Hoosiers and compiled a record of 69-77-3. Before joining Indiana as head coach in 1984, Mallory coached three other schools to national prominence. While compiling a 165- 121-4 career record at Miami (Ohio), Colorado, Northern Illinois, and Indiana, Mallory became one of only seven coaches ever to guide three different programs to top 20 finishes in the national polls. In 1987, Mallory became the first Big Ten coach to be awarded back-to-back coach-of-the-year honors. That year, he led the Hoosiers to an 8- 4 record, a second-place finish in the Big Ten, and a Peach Bowl appearance. While at Indiana, Mallory led the Hoosiers to six bowl games including victories in the 1988 Liberty Bowl and the 1991 Copper Bowl. He also led IU to a top 20 ranking in 1988 and finished his career as IU's all-time winningest football coach with 69 wins. Cam Cameron led the Hoosiers for five seasons and complied a record of 18-37. He was the second former Indiana student-athlete to take over at the helm of the IU football program. Cameron played both football and basketball for Indiana in the early 1980's. Prior to joining the Indiana coaching ranks he served as an assistant coach for the Washington Redskins in the NFL. Cameron brought an explosive offense to Memorial Stadium and a new look to Hoosier football. Indiana took the field with a new oval IU logo. Indiana averaged 23.6 points per game under Cameron's guidance. The Hoosiers enjoyed success as well in the class- room as IU was recoginzed by the American Football Coaches Association for their exem- plary football graduation rates in each of Cameron's final four seasons. In his first season with the Hoosiers, Gerry DiNardo led Indiana to a 3-9 record and a 1-7 mark in the Big Ten. IU went 3-3 at Memorial Stadium in DiNardo’s first season. Included in those three wins was a come-from-behind, 32- 29, upset of No. 23 Wisconsin. The Hoosiers trailed by 19-points in the third quarter before scoring the final 22 points of the game for the victory. Also under DiNardo, Indiana’s passing attack set the school record with 3,020 yards. During 2004, the Hoosiers had wins over No. 24 Oregon (30-24) and No. 23 Minnesota (30-21). Terry Hoeppner was head coach of the Hoosiers for two years before passing away following a lengthy battle with brain cancer. He will always be remembered as one of the most influential coaches in school history. in just his second season at the helm of the Hoosier program, Hoeppner brought the Hoosiers on the brink of a bowl appearance in 2006. He led the youngest team in the Big Ten (49 true or redshirt freshmen and 72 underclassmen overall), to five victories - its most since the 2001 campaign - and restored an enthusiasm in iU football. The 2006 Hoosiers picked up three Big Ten wins for the first time since 2001, including a 31-28 win over no. 13 (Coaches) iowa. Earning its final conference victory of the season, the Hoosiers dominated Michigan State, 46-21, on Homecoming to bring the Old Brass Spittoon back to Bloomington for the first time since 2001. Hoeppner made an im- mediate impact in his first year at the helm of the Hoosier program. Coach Hep rejuvenated an iU fan base that enjoyed a 39-percent increase in per-game attendance, a 46-percent increase in overall season ticket sales and a 110-percent increase in student season ticket sales. Bill Lynch served at the helm of the Indiana football program from 2007-10. Lynch led the Hoosiers to a 7-6 record and a trip to the Insight Bowl in his first season. He became the only head coach in Hoosier history to guide a team to a bowl game in his debut season. Lynch led Indiana to its most wins since 1993, its first bowl appearance since that same season, and its first Old Oaken Bucket victory since 2001. The team’s seven victories were the second most for a first- year Indiana head coach, behind only James M. Sheldon, who went 8-1-1 in 1905. iU boasted three all-americans, three second-round NFL draft picks, seven overall NFL draft picks, 10 all- Big Ten selections, one academic all-american and 74 academic all-Big Ten honorees in his four seasons. Lynch also went 2-2 in four Old Oaken Bucket games. Kevin Wilson completed his first season as Indiana head coach in 2011. He earned his first victory against South Carolina State. In his six seasons at IU Wilson amassed 26 wins, 12 in Big Ten play, and took the Hoosiers to back-to-back bowl games for the first time since 1990-91. He finished his career with a 4-2 record against rival Purdue. Under his watch the Hoosiers have had six players taken in the NFL Draft and have had four players garner All-American honors including a two-time winner in Dan Feeney. Wilson spent the 2002-10 seasons at Oklahoma, where he served as co-offensive coordinator and offensive line coach from 2002-05 and as offensive coordinator and tight ends and fullbacks coach from 2006-10. OU played in seven Big 12 Title games in Wilson’s nine years, going 6-1 in those appearances. His offenses were vital to accumulating an overall record of 99-24 (.805) during his time in norman, including seven 10-win seasons. Allen was named the Indiana Hoosiers head coach on Dec. 1 2016 after Kevin Wilson resigned. He served as Indiana’s head coach in the Foster Farms Bowl against Utah. Allen came to Indiana as a defensive coordinator prior to the 2016 season. He led one of the biggest defensive turnarounds in the country. Allen went 5-7 (2-9) in his first full season as Indiana's head coach. He notched his first career win at Virginia and his first Big Ten win came at Illinois. Allen previously worked as the defensive coordinator at South Florida after spending three seasons at Ole Miss as their linebacker’s coach and special teams coordinator. Allen is a Newcastle, Indiana native and spent time as the head coach at Ben Davis High School before breaking into coaching at the collegiate level.